Out with organs, choirs, wooden pews, and quiet services --- and in with full bands, big screen TVs, stadium seats, light shows, high-energy preachers, and streaming video. 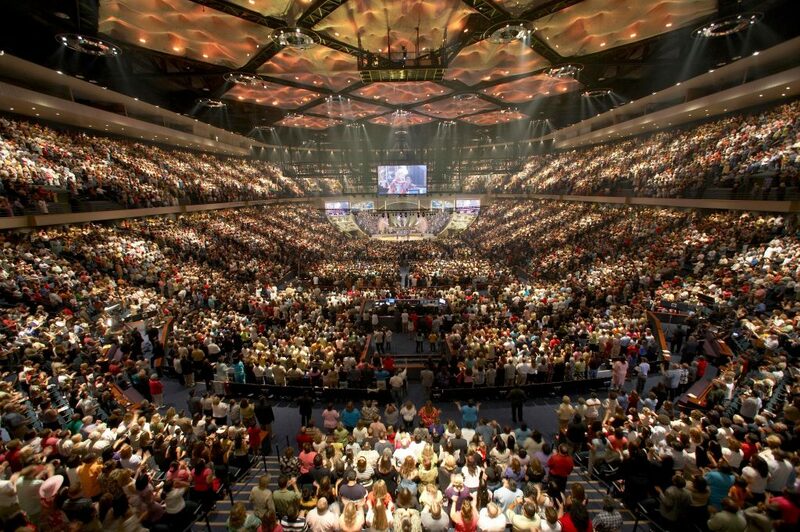 This is the age of the “mega-church”. 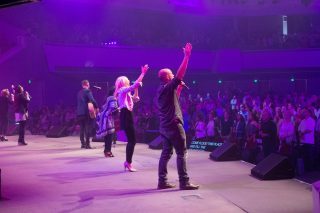 While traditional churches are losing members left right and centre, mega-churches – as they’re being called – are growing around the world. The definition of a mega-church is any Christian church with a congregation of more than 2,000, but they're often a lot bigger –Faith Tabernacle in Nigeria can hold 50,000 people at a time. Mega-churches offer a whole new way of worshiping. "The plasma screen TVs have replaced crosses, Power Point-like presentations of the words of songs and liturgical practices have replaced the hymnals," one professor told CNN. In London, a report on the rise of megachurches showed that church attendance is now on the up, despite decline in traditional churchgoers. There are now a number of churches in the city with congregations of around 2,000. Two, Kingsway International Christian Centre and Ruach, have 5,000 people each weekend. Services are streamed live or recorded and posted on church websites, for followers wherever they may be, one Texas-based US pastor beams his services to seven million people. And all this is big business. 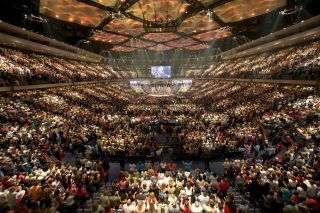 According to CNN, the US mega-churches bring in on average about $6.5 million each year. They sell DVD’s, self-help books and receive big donations from their congregations. Some open ‘franchises’, or new churches, all over the world – promoting themselves in the same way a major brand would. But for some people this wealth seems excessive. Mega-churches, like any church currently tax exempt – in other words, they don’t have to pay taxes on what they earn. Some people argue this is an unnecessary and unfair government benefit – they’ve got enough money already, a lot of which comes from donations, or from selling products to their congregation. Mega-churches can draw bigger audiences than Kanye and their preachers have a kind of rock star status to match, drawing crowds with their high personality performances. For many preachers, their lavish lifestyles are a big part of their faith. Some preach a "prosperity gospel", which teaches that faith will be rewarded with wealth. The church behind one mega-preacher, Joseph Prince, was forced to deny that he earned an annual salary of $550,000, after his wealth was reported online. His church, the New Creation Church in Singapore, is one of the largest in Asia, with a congregation of 31,000. Kenneth Copeland, who founded Kenneth Copeland Ministries (KCM), has a reported estimated wealth of $150 million, his church was one of six investigated by a US Senate committee over their finances. 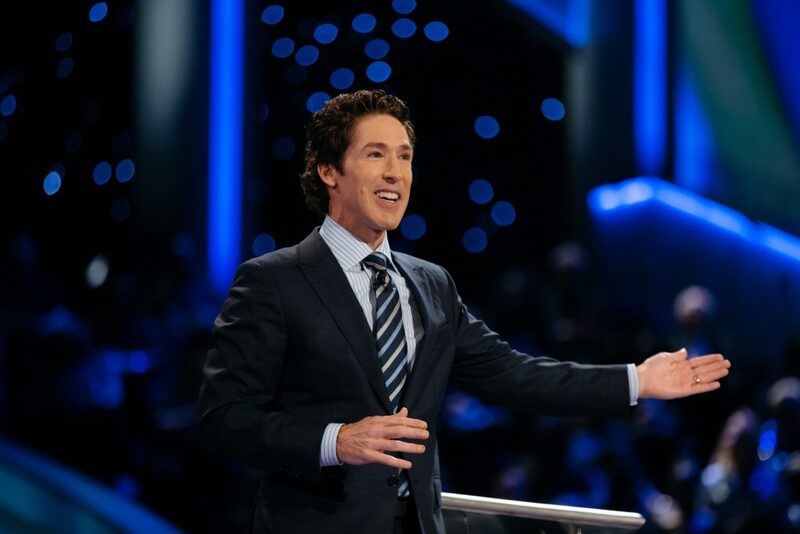 And Joel Osteen, pastor of Lakewood Church in Houston, the largest megachurch in the country, is said to have given up a $200,000 salary from the church after his earnings from his bestselling book Your Best Life Now started rolling in. “God has blessed me with more money than I could imagine from my books,” he said. Judging by the stats on how fast mega-churches are growing, criticisms of the flamboyant lifestyles pastors lead doesn't seem to be deterring people from joining the crowd. Perhaps it's because their message is pretty much in line with what young people are hearing everywhere else – get rich, and get famous – with a bit of faith mixed in.